My brother is my first best friend. Inspite of a big age difference we share that unique bond – sometimes protective, sometimes possessive, sometimes mocking and irritating, most times a comfortable camaraderie full of memories… Yesterday I was thinking of my brother and that part of brain which is the memory bank, instantly produced a Polaroid image – me in the kitchen cooking Aloo Parathas and my brother standing right next to me with a plate in hand. The steaming parathas disappeared as soon as they hit the plate with nothing but a dollop of butter that melts into little streams of succulence on the golden surface of the parathas. He never had the patience to let it cool down to an edible temperature… mouth burns did not matter and keeping track of the number of Aloo Parathas consumed was a waste of time. They remain a family favorite, although my brother is their biggest fan to date. Every time he visits from Jordan, the old parathas sneak into the menu with no need for special requests or mention and continue to disappear with the same speed. I use whole wheat flour for this. 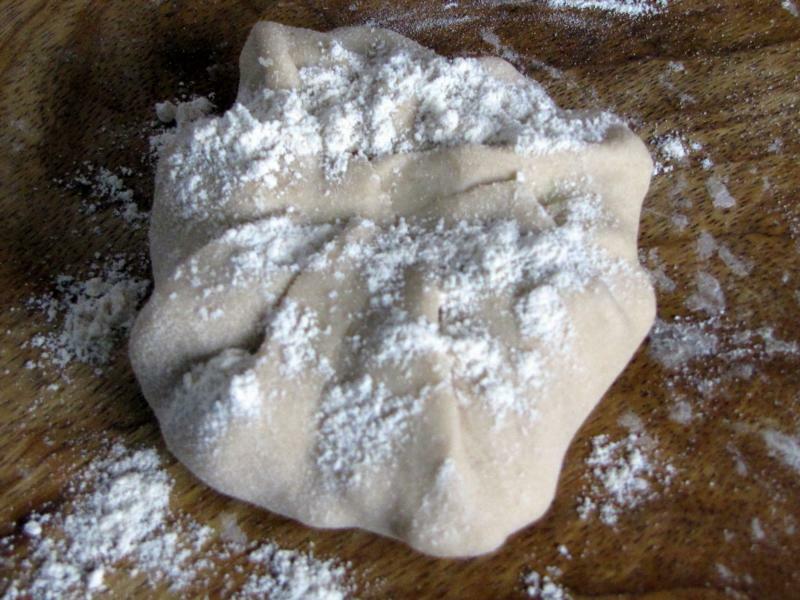 Knead it into soft dough with a pinch of salt. For the stuffing use floury potatoes that have less water content. 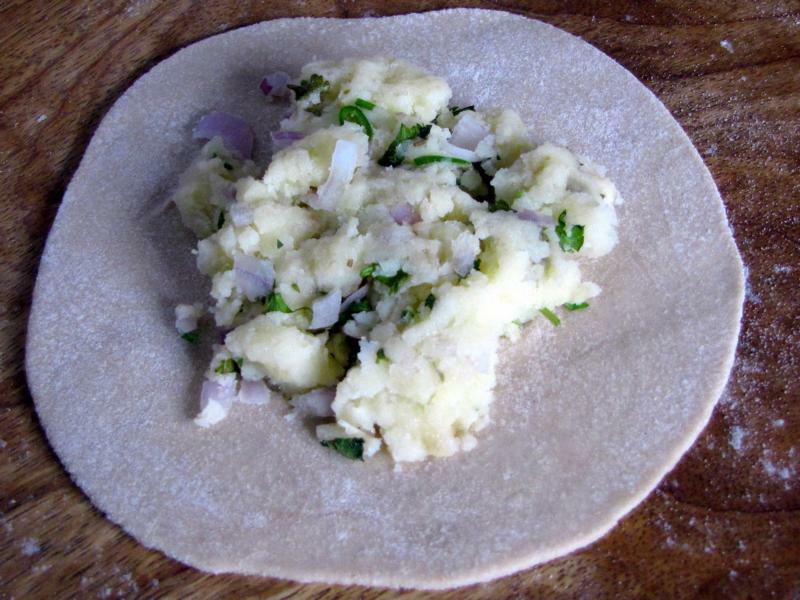 This will help to roll out the parathas more easily without making them too sticky. 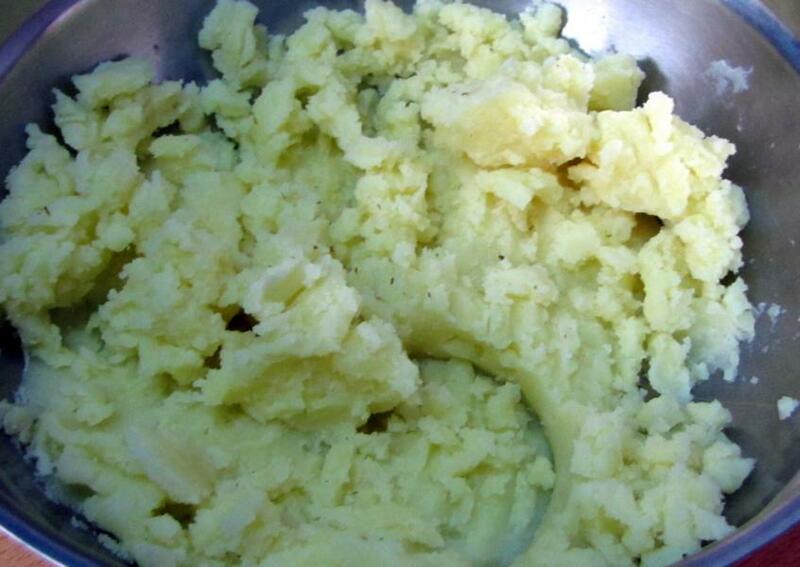 Boil the potatoes with little salt and mash well. 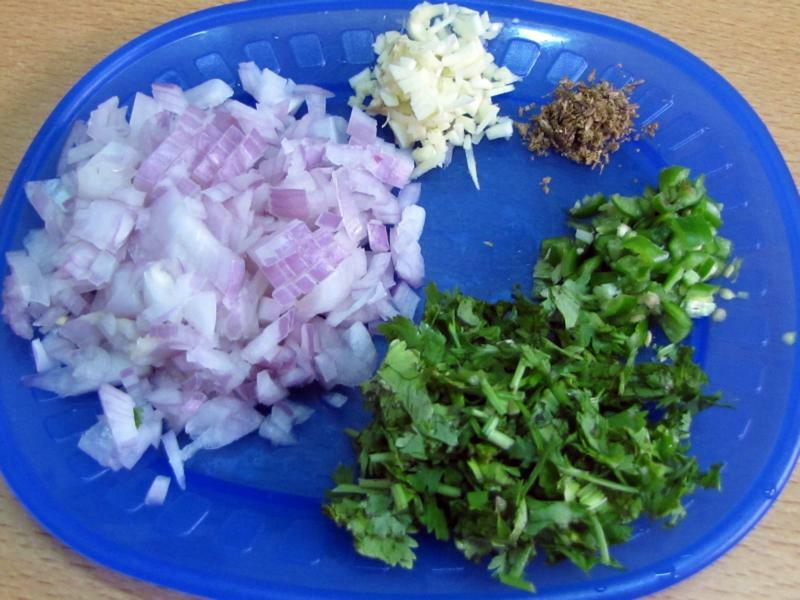 Add finely chopped onions, garlic, ginger, chili, coriander, cumin powder and salt to taste and mix well. Now that the two main components are ready, we can start assembling them together. Make small balls of the dough. Flatten a bit and roll into a small circle. Now put the filling on top of the chapatti. Then tuck the sides into the middle like a large dumpling. Flatten a bit and dust some flour. Now start to roll out again gently with light movements ensuring that the stuffing is spreading equally in all directions. Be careful to not roll out too much or else the paratha will start to tear. At the same time it should not be too thick. 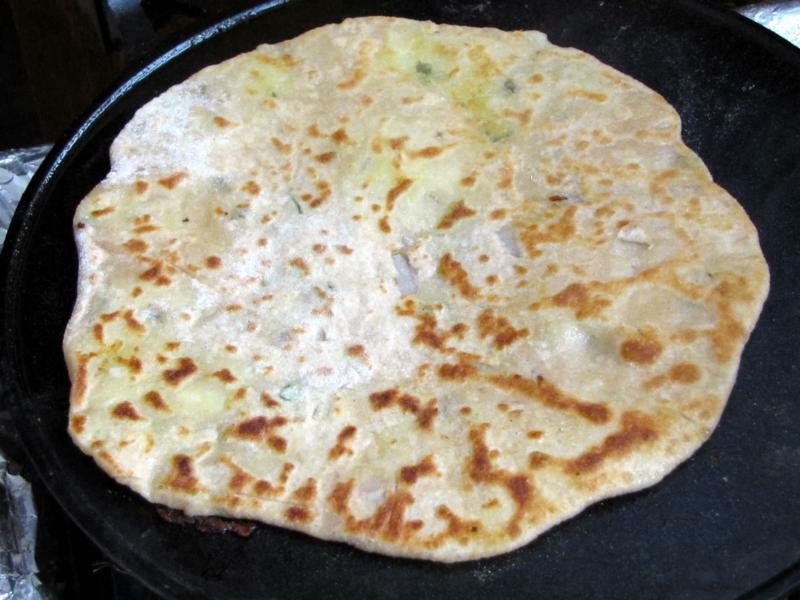 Parathas are best cooked in butter as originally done in northern India where it is staple diet. 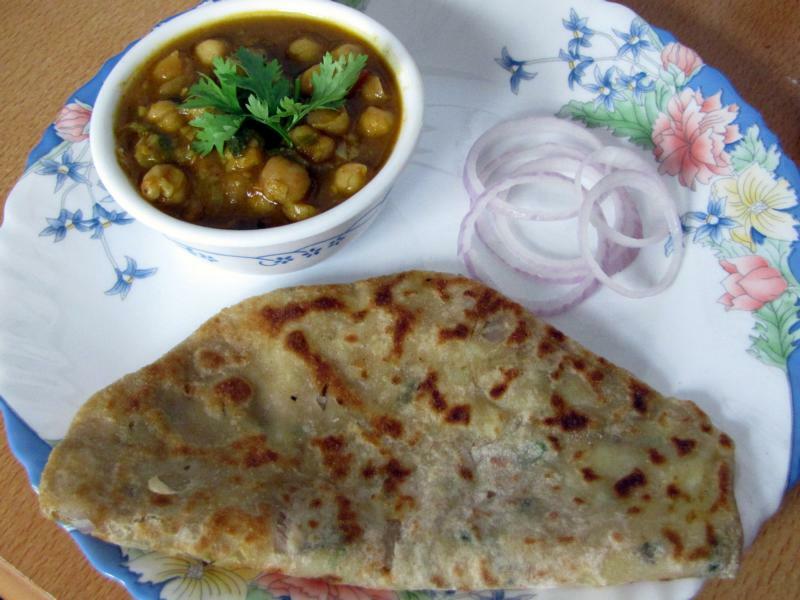 Lots of homemade fresh butter makes the various kinds of stuffed parathas richer and sumptuous. I use olive oil sometimes for a healthier version as I did for this batch. But if you are one of those who do not worry too much about your waistline and don’t mind indulging yourself once in a while…go for butter! Heat the pan and add the butter or olive oil and put the paratha on the pan. Set to low flame to ensure the inside is cooked well. After a minute, flip the paratha on the other side. Cook till the crust is a bit brown. Mix the whole wheat flour and pinch of salt. 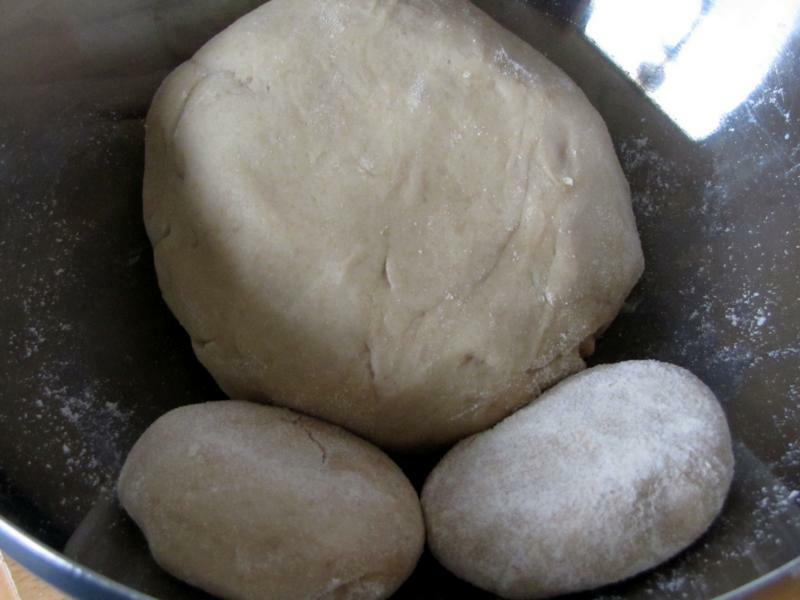 Add water little by little and knead into soft dough. Keep aside. 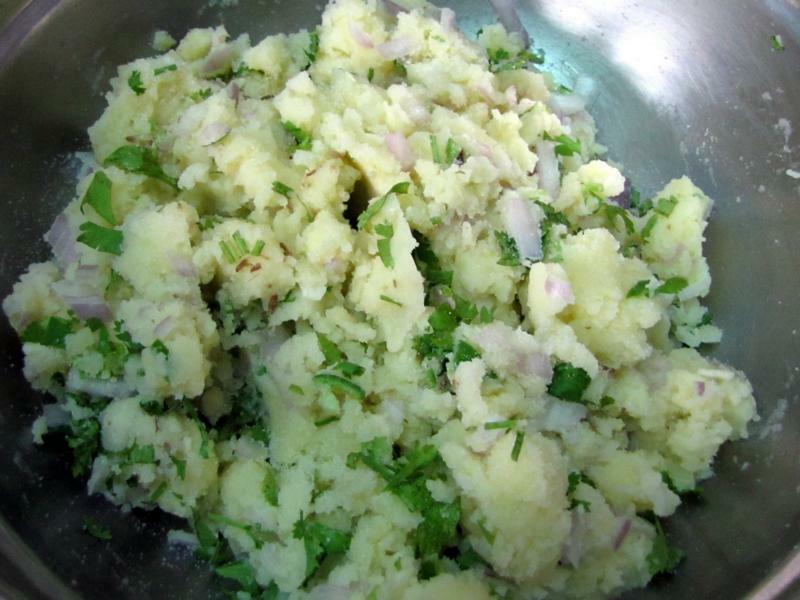 For the stuffing – in a bowl mix the mashed potatoes with finely chopped onions, garlic, ginger, green chili, coriander, cumin powder and salt to taste. Mix well. Keep aside. Make small balls of the dough. Flatten a bit and roll into a small circle. Keep some dry flour handy for dusting. Put a table-spoonful of filling on top of the paratha and tuck the sides into the middle like a dumpling. 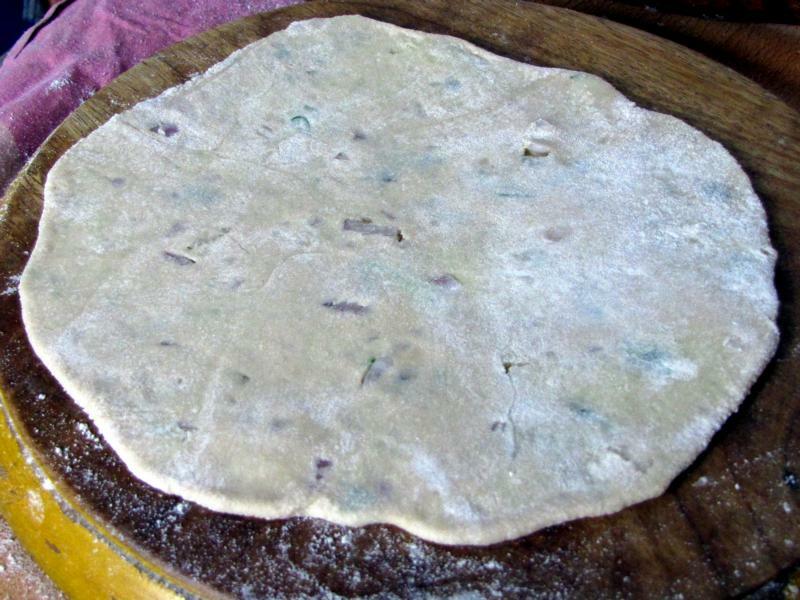 Flatten a bit and dust some dry flour on top and roll again into a full paratha. Heat the pan and pour little butter /olive oil and put the paratha on the pan. Set it on low flame. After a minute, flip the paratha on the other side. Cook till the crust is a bit brown. Serve hot with a dollop of butter. Goes best with ‘chole’ chickpeas curry.